Having just come off a stint of reading and listening to a whole bunch of non-fiction, and I really wanted a fun adventure story I could listen to in the car. 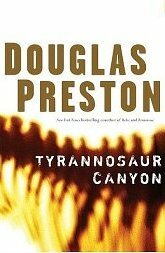 More or less randomly, I checked out Douglas Preston's Tyrannosaur Canyon from the library. It turned out to be a perfect choice. For 7 of the 10 CDs, the book followed a typical plot line. You knew who the bad guy was, the good guy, the damsel in distress and how it was going to all turn out. Still, it was a good listen. Then at disk 7, the book took a pretty major left turn. Whatever story arch I predicted went out the window, and an unexpected story unfolded from almost nowhere. This made for tons of fun. The audio version also contained an interview with the author. Sometimes these are a disaster - and sometimes they totally work. In this case, it works. The author's explanation of how he approaches writing and how he allows the story to take its won shape made me appreciate the book even more. I also learned through the interview that I had read the preceding book in the series about 4 years ago. And I liked Preston as an author then, too. If you're looking for an action story with a nice foundation in science, this is the way to go.